We had a wonderful day w Keaton as our guide. He escorted us to some wonderful parts of the Canyon where viewing was wonderful and less crowded. His knowledge of the history and geology of the region was excellent. It was like a terrific class in everything Grand Canyon. Along the way he offered wonderful stories about the early settlers and efforts to navigate the Colorado River. All in all a wonderful day! Highly recommend Canyon Dave’s Tours. This was my very first visit to the canyon. So glad I booked a tour. Can't imagine seeing it without a guide. So much info. Keaton was fantastic. Extremely knowledgeable and friendly. Not only gave us info on the canyon, but also about plant and animal life along with a short rock class during the tour. There were seven of us and EVERYONE loved it. All costs were included in the purchase price - van ride to and from the canyon, water and snacks during the ride, entrance admission to the canyon, lunch and even the gratuity for lunch. Keaton also was spot on with a pizza recommendation in Flagstaff - NiMarco's. I would highly recommend this tour. Our trip to the Grand Canyon was was beyond words, it was one of our favorite experiences as a family. Our guide Tim was so knowledgeable on all facets surrounding the history behind this amazing Marvel and his passion was non-stop throughout our entire experience. From start to finish, the tour was well thought out and our guide, Keaton, was very knowledgeable about the history and geology of the Grand Canyon. The information he provided brought the experience alive and made it very enjoyable. This was a great tour to take with family of all ages. Keaton is an amazing tour guide. He took us to some incredible scenic points and gave us a wonderful lesson on geology. He is very knowledgeable about the area and tells wonderful stories. 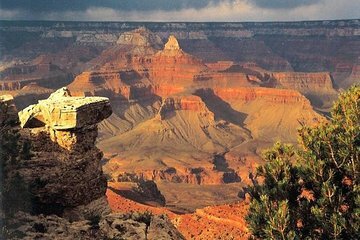 This tour is a great way to see The Grand Canyon.Keaton is a very knowledgeable guide, giving the history of the geology, exploration, and landscape of the canyon.The van had seven passengers, and we were picked up right at the hotel, enabling my husband to enjoy the scenry without having to worry about driving. Included in the tour was a drive to Tusayan Indian ruins and a lunch in Cameron.Definitely worth the price! The knowledge of the guide was vast and he held everyone's interest as we moved to different view points of the Grand Canyon. I highly recommend Canyon Dave!!! This tour lasted about 8 hours and was absolutely excellent. Good mix of sightseeing, education and fun. Keaton, our tour guide, was relatively new but really, really good. I would recommend this tour to anyone that wants a great one day experience of the Canyon. Only 6 people on the tour so it was tailored to our needs. We highly recommend this trip! Kenny was an excellent guide and made for a wonderful tour experience.